Now that the season is changing and people are preparing for a cold winter, many homeowners will seek out ways that they can save money and conserve energy without sacrificing any of the comforts they’re accustomed to in their home. Unfortunately, many homeowners don’t consider ways to improve the efficiency of their refrigerator, or even their extra freezer. Not only are these two of your most important appliances in your home, they also both consume energy every minute of the day. 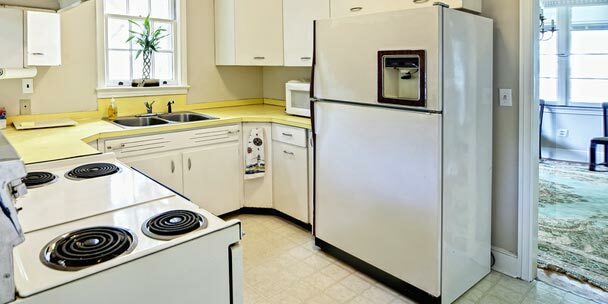 Firstly, it must be noted that if your refrigerator is over 15 years old, you may want to consider an upgrade in order to take full advantage of potential energy savings. If you find yourself with an aging refrigerator, consider recycling your unit and upgrading to an Energy-Star certified appliance. The initial cost for a new unit may be high, but you’ll save in the long-run on energy savings. The good news, however, is that increasing the efficiency your refrigerator is not only easy and inexpensive to do, but it can be done a variety of ways. Let’s take a look at ten ways every homeowner can improve the energy efficiency of their refrigerator or freezer. Although this important plastic lining is critical for making sure your appliance runs smoothly and efficiently, it can sometimes be easily overlooked. Also called a gasket, this seal protects your fridge from any unwanted warm air coming through. It is very common for gaskets to wear and lose some of their suction as the doors are consistently opened and closed over time. While your refrigerator can operate efficiently for years, it is likely that your gasket can weaken or tear after only a few years of use. In order to keep your food chilled to the perfect temperature, the compressor kicks into high gear when it’s near sources of heat. Not only does this cause your fridge to work harder, it’s a quick waste of energy and may even shorten the lifespan of the appliance. When designing your kitchen, try to keep your refrigerator away from the range, oven, dishwasher, or any other appliance that may omit high levels of heat. It’s also wise to keep it out of prolonged amounts of direct sunlight in order to prevent it from working in overdrive. The condenser coils of your refrigerator remove warmth from the unit. 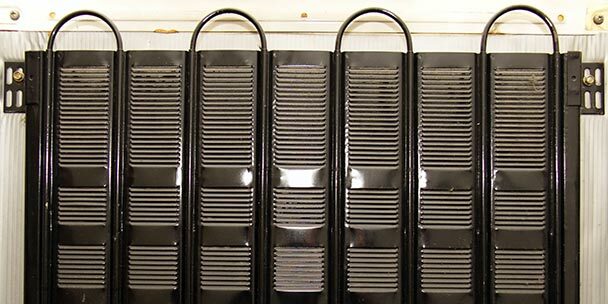 If these large coils on the back or underside of your fridge start to get dusty, it becomes difficult for them to continue operating in the efficient manner in which they were designed. If these coils are working twice as hard as they are meant to, it causes heightened energy consumption that could eventually lead to problems for your appliance down the line. In order to make sure that your coils are properly cleaned, invest in an inexpensive bristle brush to easily remove any dirt that has accumulated over the years. You don’t have to clean the coils often, just enough to prevent build-up that affects the unit’s performance. Even the smallest details can save you a great deal of money on your next energy bill. By allowing your leftovers time to cool down after a meal, you are reducing the amount of heat added to the interior of your appliance. You should also properly store your food in protective wrapping or Tupperware prior to placing your dish in the refrigerator as it prevents any residual heat from escaping into your unit. Just be careful, don’t let your food sit out cooling for too long, as it may spoil. No matter what type of refrigerator you have, this is the most obvious—and cheapest—way to reduce your energy usage. 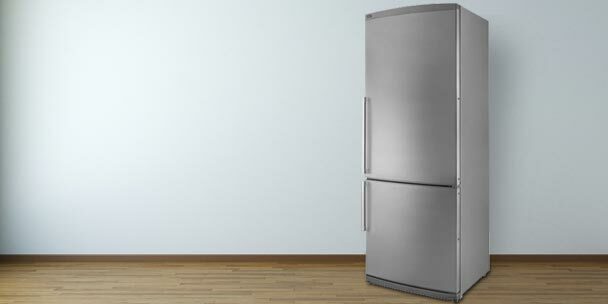 Standing in front of an open fridge can and will have a large impact on your energy bill. As the cold air escapes from your appliance, it requires more energy to return it to its intended temperature. If possible, decide what you want prior to opening the doors of your refrigerator or freezer. Making decisions before cracking open your fridge allows you to limit the amount of times you open it on a daily basis, which as a result will conserve a great deal of energy in your home. 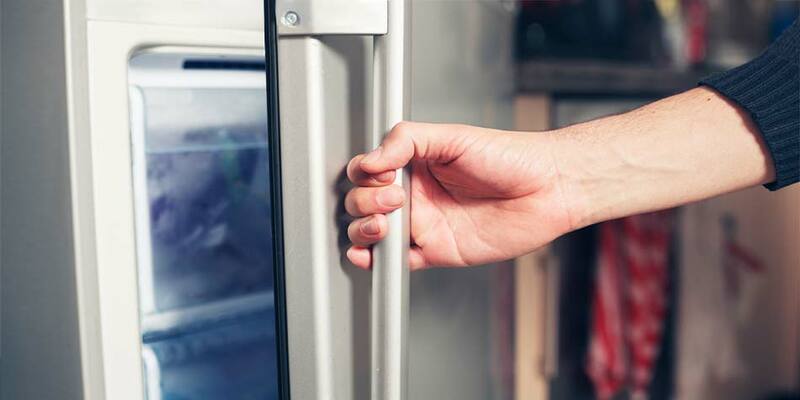 Rather than opening up your freezer door to get some fresh ice cubes or grab a bottle of water, use the in-door feature to reduce the frequency in which the doors are opened. This simple step can easily improve the efficiency of your appliance, saving you money and potentially increasing the lifespan of the unit. If your refrigerator doesn’t have an ice dispenser built-in, you should consider buying a portable ice maker for your countertop. This handy appliance allows you to get the ice you want without ever having to open your freezer door. Harness your inner neat-freak and organize your refrigerator and freezer’s interior. 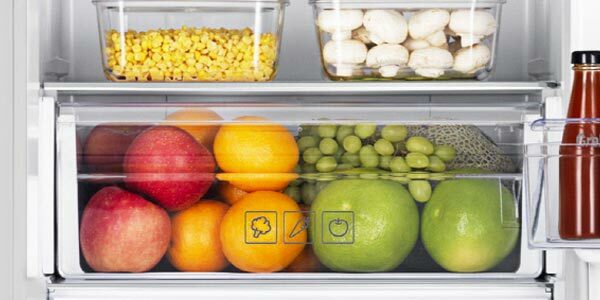 When your items are easy to find inside of your fridge, you can spend less time with the door open tracking down your food, ultimately reducing the amount of energy you use. You should also consider reducing the amount of items on the top shelf of your refrigerator, especially large bread items, food boxes, or serving dishes. This is a prime location in your fridge, and should be used for your most used items. The easier they are to grab, the quicker the door closes. Additionally, larger objects stored at the top of your appliance may trap heat inside of your unit, which eventually forces your compressor to work harder to overcome and costing you more money in the long-run. Similar to your air conditioner, turning the temperature of your appliance up slightly can translate to huge savings on your electric bill. 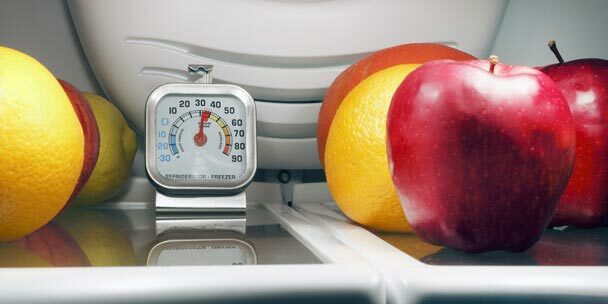 In order for your unit to provide the greatest efficiency for your family, set your refrigerator temperature to between 36-38°F and the freezer to between 0-5°F. If your appliance does not provide exact degree readings, setting your unit to the midpoint on the temperature dial usually does the trick. When switching over to a new temperature level, keep in mind that it can take up to 24-hours for the update to fully take effect. But, you will start to notice your energy usage going down by the time the next bill shows up. While not all refrigerators are equipped with this feature, many modern appliances now have compact heaters that are built into the walls in order to inhibit humidity from condensing on the external surface. Unless you have a great deal of noticeable condensation on your unit, you can activate the energy-saver or power-saver switch in order to easily disable this feature. Depending on your refrigerator, it may require a manual defrosting. Buildup can accumulate on the coils inside of your refrigerator forcing your unit to work overtime. If you do not regularly defrost your refrigerator and freezer, it may be difficult for the appliance to maintain cooler temperatures. 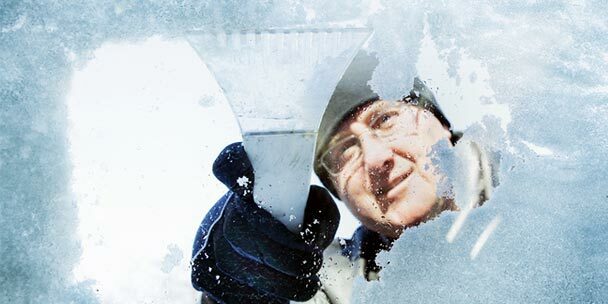 This frost buildup can cause a large waste of valuable energy and cost you quite a bit of money on your monthly bills. If you do not have air conditioning and live in a hot, humid climate, it is even more imperative that you regularly defrost your manual or partially automatic refrigerator. By following these ten easy steps to increase the efficiency of your refrigerator, you can reduce your energy consumption and save quite a bit of money on your electric bill each month. If it is time to retire your older model, be sure to look for an Energy Star rated appliance for your next purchase. You can also recycle your old refrigerator in order to further optimize your green contributions to the environment. …You should also properly store your food in protective wrapping or Tupperware prior to placing your dish in the refrigerator as it prevents any residual heat from escaping into your unit. The idea of putting the container in the refrigerator is that the residual heat escapes! If it doesn’t escape, how will the container be cooled??? 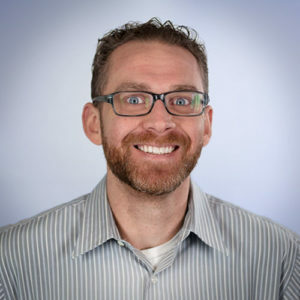 Other sites often mention increasing compressor cycle times (fewer compressor startups). Suggestions include having more food/mass in freezer, but only works as long as you maintain good airflow spaces so food cools during cycle and not after (more surface area=good). A block of ice will help, and be useful backup for power failure, but does not have large surface area to mass (why a lead brick would be good, but not great). Surprised no one markets a finned copper (metal with best heat conductance) block for increasing efficiency in a freezer with unused space (yes, rarely happens). By what percentage range could this improve the efficiency of your fridge by? Can I use fans externally to cool off the compressor or the black coil wound all over at the back of the refrigerator? My electricity bill is high due to old version refrigerator .can I keep my refrigerator switch off for 2-3 hours to save power? 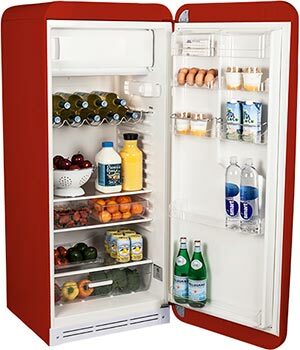 When on vacation should we have a full load of minimum load in the refrigerator?